During a family reunion when I was growing up, my Grandma let us grandchildren take turns choosing a quilt to keep. On the back of each quilt a pillow case was sewn to the bottom, and the quilt could be folded up into the pillow case to make a pillow! 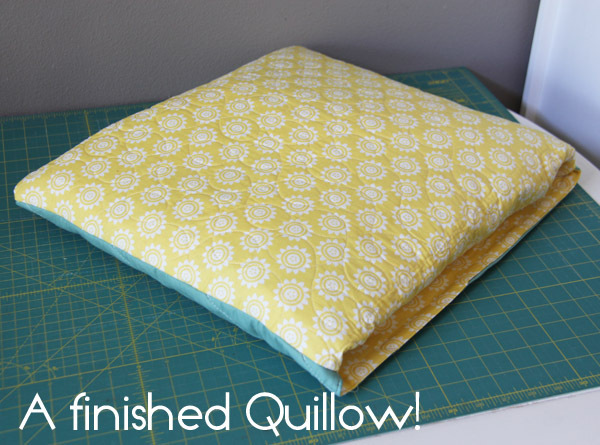 A quilt + a pillow = a quillow! I’ve had a weird fascination with quillows ever since. I even included a pattern for a quillow in my book! 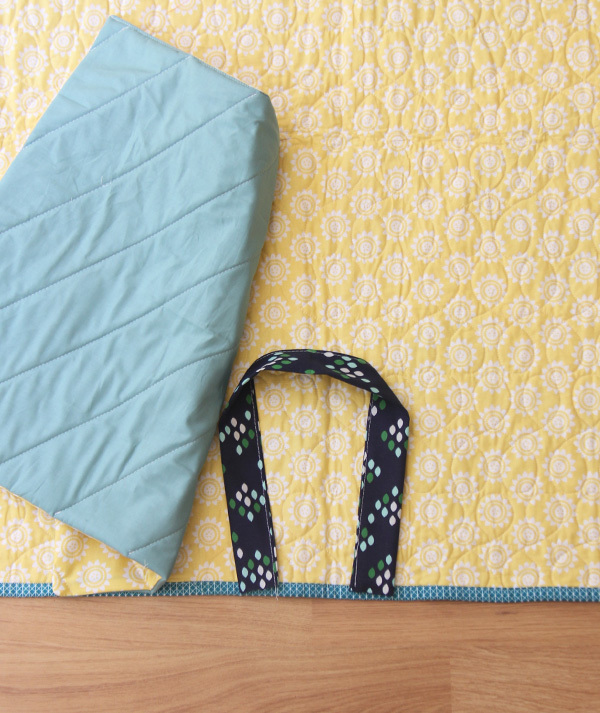 I’ve been meaning to write this tutorial for years, and hopefully you will find it helpful if you ever find yourself wanting to turn a quilt into a quillow! 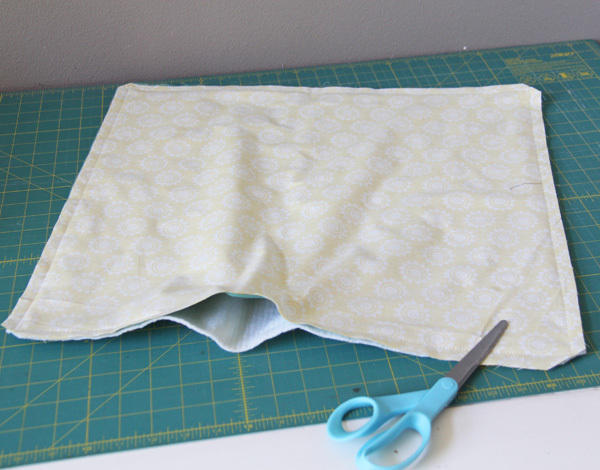 For this tutorial I’m making my Lucky quilt into a quillow, and since my quilt is done, all I have to do is add a pillow cover/pocket to the back of the quilt. Divide the width of the quilt by 3 = the width of your finished pillow cover. Divide the height of the quilt by 4 = the height of your finished pillow cover. Add one inch to both measurements to account for the seam allowance (I use 1/2″ seam allowance). For example, my Lucky quilt is 60″ x 73″. 60″ divided by 3 is 20. 73″ divided by 4 is 18 1/4″. So I my finished pillow cover needs to be 20″ wide, by 18 1/4″ high. Add an inch to both of those numbers and that is how large I will cut my pieces of fabric for the pillow, 21″ x 19 1/4″. After you know the size to cut your pillow cover fabric, cut a pillow front, a pillow back, and a piece of batting (optional) to that size. I used the same fabric as my backing so my pillow cover would blend in on the back of the quilt. Normally I would have the same fabric for the front and the back of the pillow cover, but for the sake of this tutorial I used a teal fabric. Layer the batting on the bottom, then the pillow back and front fabrics on top of the batting, right sides together. Pin around the edges. 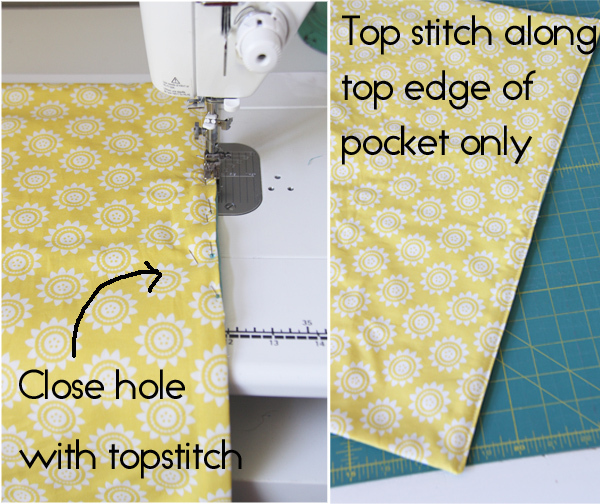 Sew along the edges with a 1/2″ seam allowance, leaving a hole at the top (along a wide edge or the top of your pocket) for turning. Trim the excess from the corners and turn the pillow cover right side out. Press the edges well. Pin the hole closed, you will sew it shut in the next step, or when you sew the pillow to the quilt. Topstitch along the top (wide) edge of the pillow cover, 1/8″ or so from the edge. If your hole from turning is at the top as mine was, sew the hole shut as you sew. Quilt the pillow cover as desired. Sometimes I don’t bother quilting it, but if you have the forethought to quilt the cover in the same pattern as the quilt, it will look amazing! 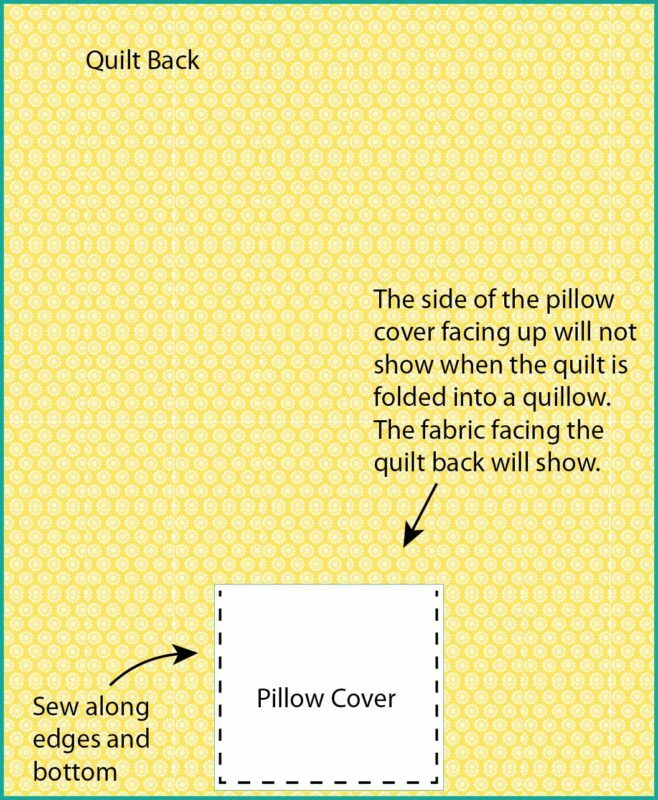 Place the pillow cover on the bottom back of the quilt, centered in the middle and up away from the binding as shown. Pin the edges to the quilt. 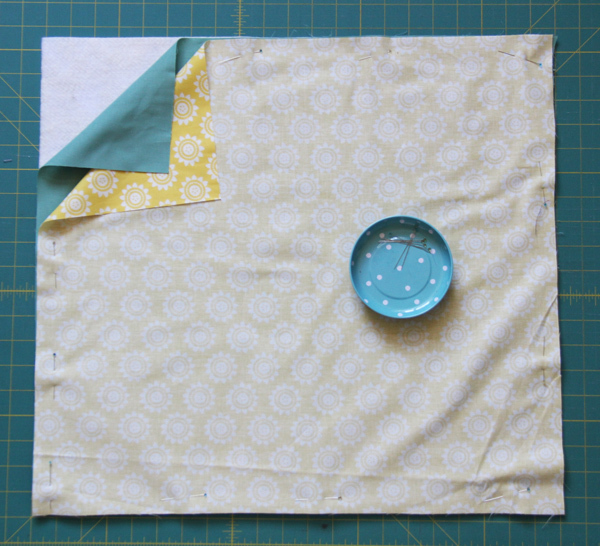 Sew the sides and the bottom wide edge to the quilt, but do not sew the top! Keep in mind that the pillow cover fabric facing up will NOT show once the quilt is folded into a quillow. The fabric facing the quilt back, will show. Yes…you will see the straight lines of sewing on the quilt front, but usually it blends into the quilting pretty well if you use the same color of thread. Once the pillow cover is sewn on you are done! Now to fold your quilt into a quillow! The first time you will think I’m crazy….but it becomes much easier. I even taught my 7 year old how to do it for the sake of these pictures. Lay the quilt right side up, with the pillow cover at the bottom. Fold one of the long sides of the quilt to the center, just until you see the edge of the pillow cover at the fold. Repeat with the other side. 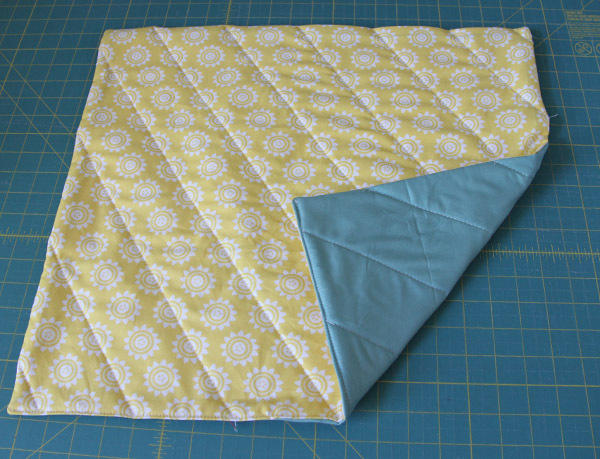 Fold the quilt down from the top to the bottom four times, the last fold will be resting on top of the pillow pocket. This next part takes some practice, but it’s easy once you get the hang of it. I like to flip the folded quilt over on my lap so the pocket is facing me, and turn the pocket inside out, smooshing the quilt into the pocket as you turn it inside out over the quilt. It sounds trickier than it is, and your 7 year old will need help with the last part. Once it’s all folded in there and smoothed out a bit, you’re done! This definitely isn’t a full pillow you would want to sleep on unless you were in a pinch, it’s more like a flat cushion. My Grandma made quilts with the fluffy polyester batting…and those quilts turned into very fluffy quillows! My picnic quilt in my car is a quillow, and a few of my kids quilts are quillows and I love that I can fold them up and store them easily. It makes a great gift too…tuck a book inside the pocket and they will love unfolding their new quilt! I have crazy love for quillows. Actually I think I just enjoy saying “quillow” over and over. Great tutorial. I’ve been wanting to make a Quillow for years, having seen one at the school I used to work at. This is great! Thank you for the tutorial – and well done to the seven year old assistant on such a marvellous job of making the folding look so easy!! Thank you for the tutorial. 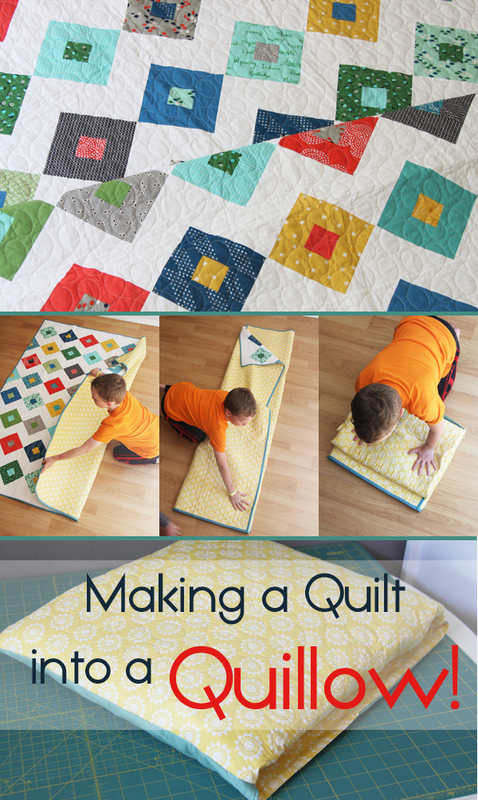 This is a fantastic idea for a kids quilt! Reminds me of the ones that have the pocket for your feet to go into at the bottom too! Thank you. Yes! 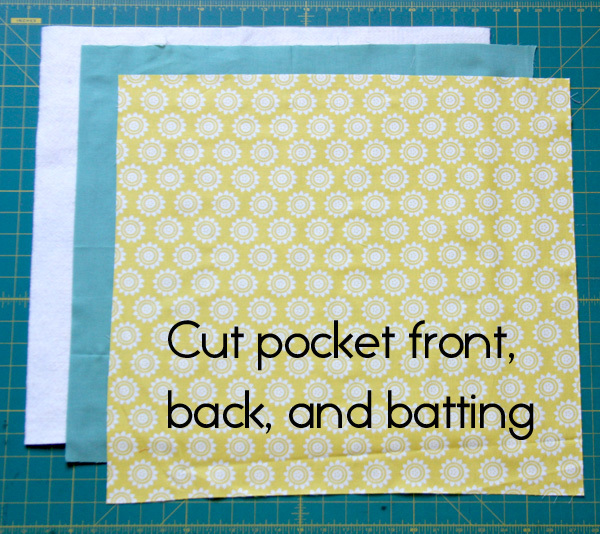 That’s the best part….when you are using the quilt you can tuck your feet inside the pocket! What a handy thing to know – and your helper did a wonderful job!!! Kudos! Yesterday I was looking up quillow patterns and your book popped up! Thanks for this. I still will be ordering your. Love it!! 20 years ago I made a quillow in a class I took in high school called “Fashion and Fabrics.” I would have never guessed then that I’d later become so addicted to fabric and quilting! I read the comments and quite a free say just what I’m going to say, the empty pillow case is ideal for tucking your feet into! 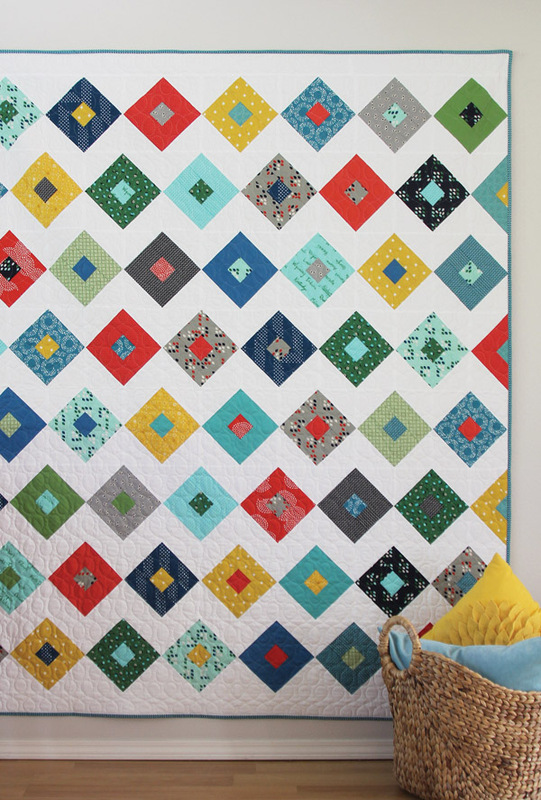 Thanks for this – i have been looking for a tutorial that included the proportions so any quilt could be made into a quillow! Thank you for this tutorial !! I’ve been putting off this project but now I feel confident that I can make it correctly. I love quillows. Made several over 20 years ago. Still using them today. They make a great gift too. Yea; a quillow tutorial! When I was a kid, my grandma made every one of her grandchildren a quillow (this is amazing to me, with such a big family!) and we LOVED each having our own, made with special prints she picked for us! I never knew quite how to do it, so thanks for the tutorial. 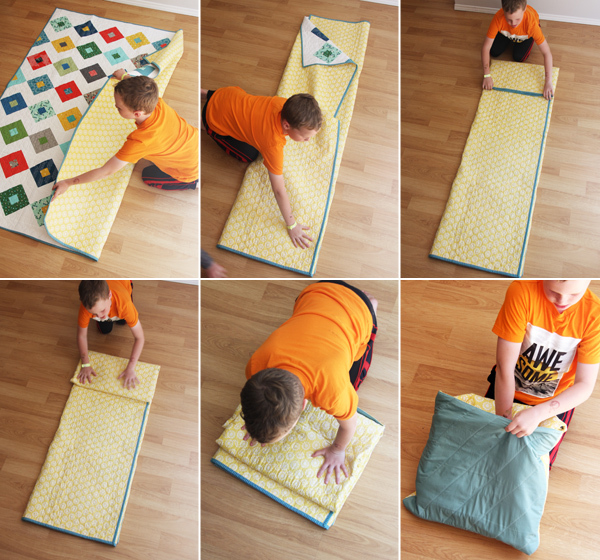 Thank you, this is the best tutorial I have found on how to make a quillow. Your tutorial is so clear!, thank you! This seems like a great way to protect quilts when not in use. I think I will add these to my quilts that are already finished. This is great and so easy to follow. I’m just starting to enjoy quilting and I believe this will be a nice piece to work on. So when your stitching the pillow on, you’ll see the stitching on the front of the quilt? How can you make it for an adult ? 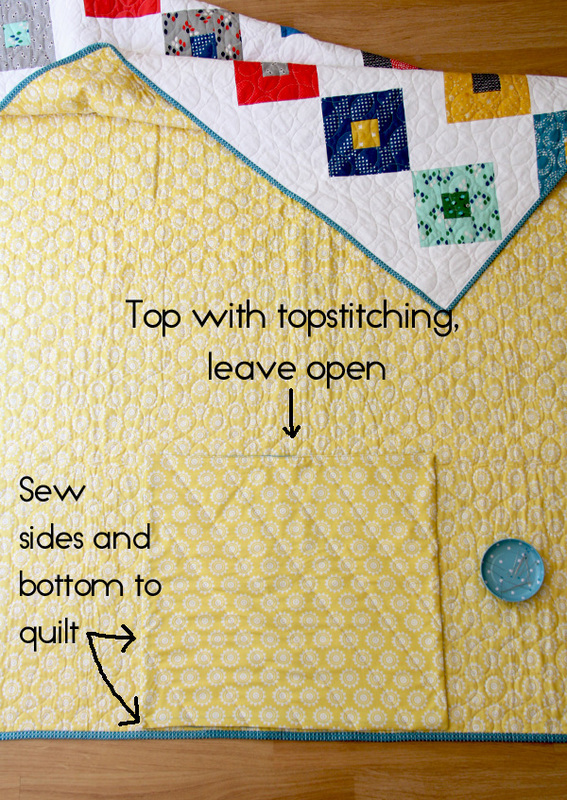 You can do this on any size quilt, use the guidelines on the post and you can make one for any adult sized quilt! Nice idea and a good tutorial. Thank you!